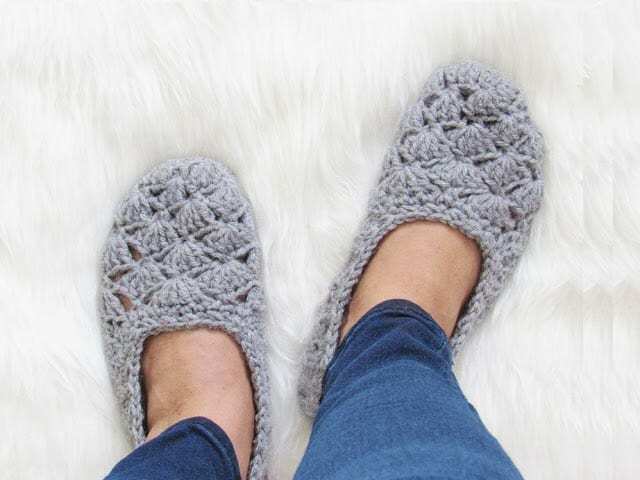 I wanted to design a free crochet slipper pattern as it has been requested by my readers many times before. 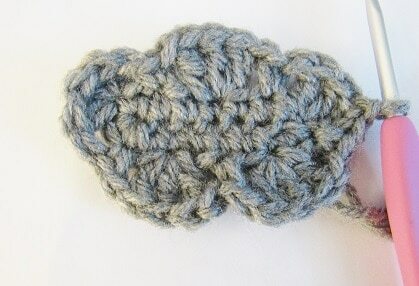 So I came up with these quick crochet slippers that are simple and elegant at the same time. You can work from the free pattern given below or purchase an Ad-free PDF for $2.50 here. Now that the holiday gifting rush is over you can make these warm slippers for yourself. Some self-love won’t hurt, will it? I hope they keep you warm and comfy. 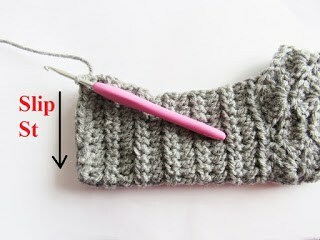 This is an easy slipper pattern that is worked in one piece. Once you make one, I bet everyone in your family would want one too. 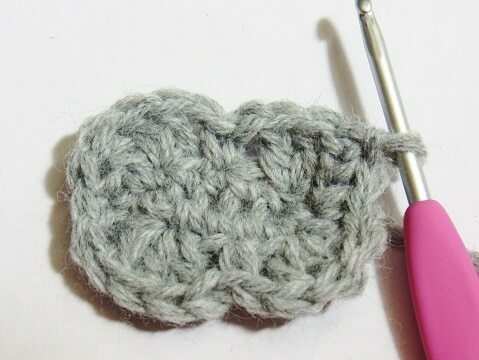 Shell: 5 dc worked into the same st.
sc2tog ( single crochet decrease): This will join 2 sts into one. To work a sc2tog, [insert your hook into the next st and pull up a loop]2 times, yarn over and pull through all the loops on your hook. Note: Sizes Small and Medium are grouped together and size Large is given separately. 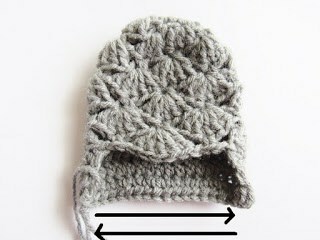 Note: The end of the round stitch counts include the chains as well. Note: You will be skipping dc sts to work into the sc. Round 8: Repeat Round 6. Do not turn and do not fasten off. 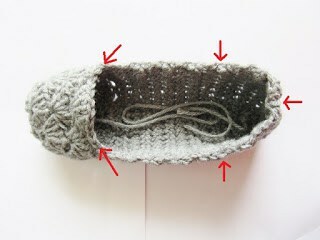 Note: The rest of the slipper is worked in rows and then the back side is seamed to close the slipper. 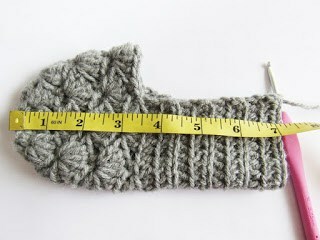 Repeat the above 2 rows until your shoe measures 6 1/2 inches for size Small and 7 inches for size Medium. Note: Maintain the sequence of working into the back and front loops. On the right side of the shoe, you will work in back loops and on the wrong side you will work into the front loops. Repeat the above increase row 2 more times to end in 27 sts and turn. Last Row: Ch 1, 1 sc in same st as ch 1, 1 sc in next 3 sts, 1 hdc in next 4 sts, 1 sc in next 2 sts, (sc2tog)3 times, 1 sc in next 2 sts, 1 hdc in next 5 sts, 1 sc in last 4 sts.——24 sts. Now fold and seam the back side of the slipper with sl sts. Fasten off. You will now work 2 rounds around the opening of the slipper with a few decreases thrown in. This will make your slippers snug and keep it from falling off your feet. You will be working across row ends for the most part and will have to distribute your sc as evenly as possible. Round 2: Ch 1, 1 sc in same st as ch 1, *(sk 1 st, 1 sc in next, 1 sc in the previous skipped st), repeat from * to end and sl st to the first sc. Fasten off and weave in the tails. Your slipper is now ready to keep you warm and comfy! Note: Please take a look at the pictures given for the smaller sizes before you start. 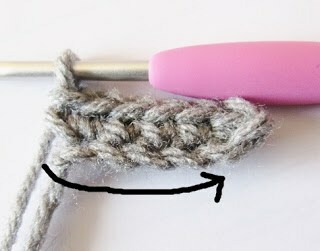 Note: This part is worked in rows and then the back side is seamed to close the slipper. Repeat the above 2 rows until your shoe measures 7 inches. Repeat the above increase row 2 more times to end in 29 sts and turn. Repeat above row one more time. Last Row: Ch 1, 1 sc in same st as ch 1, 1 sc in next 3 sts, 1 hdc in next 5 sts, 1 sc in next 2 sts, (sc2tog)3 times, 1 sc in next 2 sts, 1 hdc in next 6 sts, 1 sc in last 4 sts.——26 sts. Round 2: Ch 1, 1 sc in same st as ch 1, *(sk 1 st, 1 sc in next, 1 sc in the previous skipped st), repeat from * to end and sl st to first sc. Fasten off and weave in the tails. 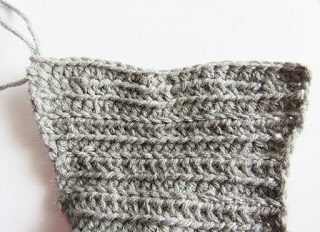 You can see the most popular Boots pattern on my blog here. See the full collection of patterns here: Pattern Gallery. I saw these on Facebook and the are fabulous ? Thank you, I am so glad you like them. You can copy paste it onto a word document. can you email this pattern? I’m looking at Ur pattern ony Android phone and would like to email it to myself. Could U tell me how to do that Plz. I don’t want to loose this pattern or Ur website. You are very welcome, I am really glad you like them. Thank you for the free pattern. I am a beginner. I love the slippers. Looking forward to making a pair. I am glad you like it. Thank you for visiting my blog. These slippers are wonderful and so easy to make, thank you so much, I am sure I will be making lots of these! Hi Annette, I am really glad you like them. Thank you for visiting my blog. In regards to the pattern are all sizes worked the same except for the length in which you measure ?….I don’t see any parentheses for changing stitches for the size…… Thank you…..
Hi Veronica. sizes Small and Medium differ only in their lengths but size Large differs in the shell rows as well. Size Large is given separately. You will now work 2 rounds around the opening of the slipper with a few increases thrown in. This will make your slippers snug and keep it from falling off your feet. You will be working across row ends for the most part and have to distribute your sc as evenly as possible. Where are the increases you are referring to? I’m confused. Hi Pat, please take a look at Picture 7 in the pattern. It shows you where to work the decreases. I hope that helps. I am so sorry, that are decreases(sc2tog) and not increases. Thank you so much for bringing this to my attention. I just corrected it. I’m sorry to be such a pest. I still don’t know where the INCREASES come in. You went from 24 stitches to 48 stitches. Some where I have to 2 sc in every stitch, is that right? Please forgive my ignorance. After the 24 stitches, you seam the back side and fasten off. The 48 stitches are then worked around the opening of the slipper. You are not increasing 24 to 48 here. Makes sense? I think a little light bulb may have gone off in my head! By Jove, I believe I got it!!! !Thanks for being so patient with me. 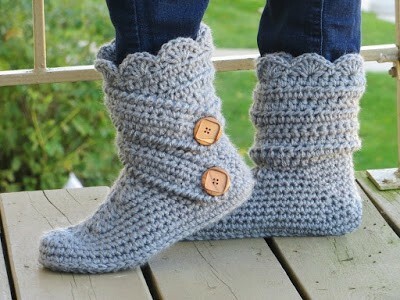 The slipper is beautiful and I really want to make some. Again, thanks for all your help. When I finish a pair is there somewhere I can post it so you can see them? No problem, Pat. I am glad I could help. You can tag me on Instagram, #crochetdreamz. Thank you. These look great, I can’t wait to make a pair or two! Any suggestions on what I can use on the bottom to make them no slip? Thanks so much!! A few dots and squiggles with puffy paint is said to work. Hello. These are lovely slippers and I would like to make a pair for my elderly aunt. However I have a question. Is there a way to make them a little taller so they go a little bit higher near the ankle? Perhaps adding more rows? Please advise. Hi Carol, You can add more increases to the rows near the ankle to make it taller. It will get clear once you start making one. Thank you so much! Ready to begin these slippers. They will be a lovely birthday gift for my 95 year old Aunt!